The shallow target in the Gjøkåsen prospect in the southeastern Barents Sea was found dry. Equinor has completed the drilling of well 7132/2-1 Gjøkåsen Shallow in PL 857 in the southeastern part of the Barents Sea. The well is dry. The target was to prove petroleum in reservoir rocks from the Middle and Early Jurassic Age (the Stø, Nordmela, Tubåen and Fruholmen formation) and secondly in reservoir rocks from the Early Cretaceous and Late Triassic Age (upper part of the Snadd formation). In the primary exploration target, well 7132/2-1 encountered about 15 metres of sandstone reservoir with good reservoir quality in the Stø formation. In the Nordmela, Tubåen and Fruholmen formation, the well encountered about 25 metres of sandstone reservoir with very good reservoir quality. No reservoir rocks were encountered in the secondary exploration target in the Lower Cretaceous. In the upper part of the Snadd formation, the well encountered a water-filled sandstone reservoir of ca 30 metres with moderate to good reservoir quality. This was the first exploration well in PL857 and in this remote part of the southeastern Barents Sea. Partners in PL857 are Equinor, operator with 40% working interest, Lundin Norway, Aker BP and Petoro with a 20 percent working interest each. Gjøkåsen is located on the Signalhorn Dome at the border of the Tiddlybanken Basin and one of the last major structures that not had been drilled. Gjøkåsen was pre-drill regarded as a high risk-high reward opportunity and therefore the dry well may not come as a surprise but yet another disappointment in the southeastern Barents Sea. The other large structure, which the industry had high hopes for, Korpfjell was a major disappointment with only a minor gas accumulation. 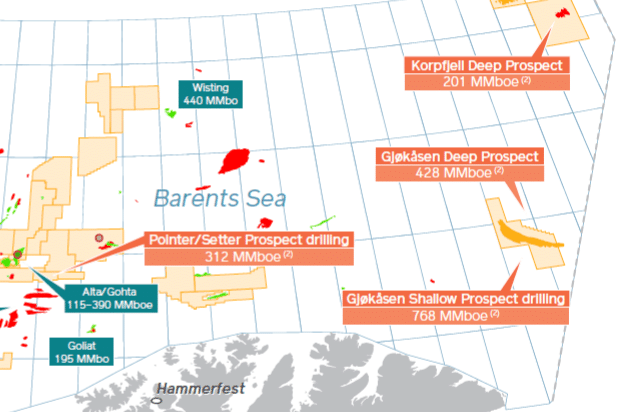 Equinor and partners will target the deeper part of Korpfjell later this year. CSEM data is in accordance with the well result and does not support a hydrocarbon accumulation in Gjøkåsen Shallow. CSEM has been proven very reliable to predict the presence or lack of hydrocarbons in shallow targets in the Barents Sea (in Wisting for example read also “Wisting is growing”). In the Jurassic section of Gjøkåsen EM data did not show any resistive anomaly according to EMGS. What about the deeper levels? “In the Triassic interval we do see some resistivity variations, but the average resistivity map does not indicate a distinct resistive anomaly.” says Pål Gabrielsen. However, less CSEM sensitivity at this depth interval combined with lack of good calibration points in wells and CSEM data to Triassic discoveries creates a larger interpretation uncertainty for this interval. Equinor will now proceed to drill the Gjøkåsen Deep exploration well 7132/2-2 also in PL857 to test the deeper exploration targets in the same structure. 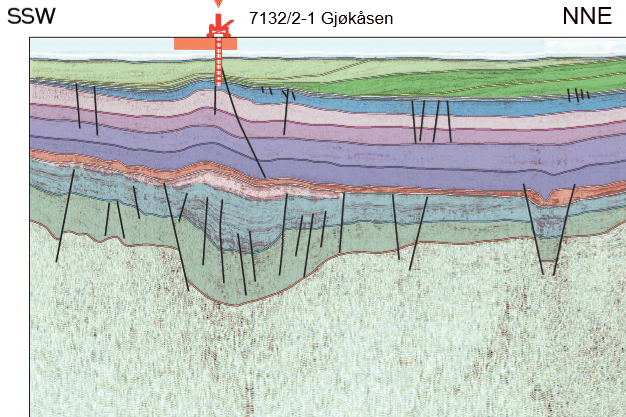 The result of the Gjøkåsen Shallow well has no impact on the prospectivity of the Gjøkåsen Deep target states partner Lundin. Lundin estimates the mean recoverable resources in the Gjøkåsen Deep prospect to be 428mmboe.